The art of losing isn’t hard to master. Is it? Is it easy to face the losses? The defeats? The nominations? Or worse, lack of nomination and defeat? Let’s face it, we live in the era of the big prize. It’s how we tend to argue for the value of what we love. We prize it. And that, my friends, makes the creative life difficult. 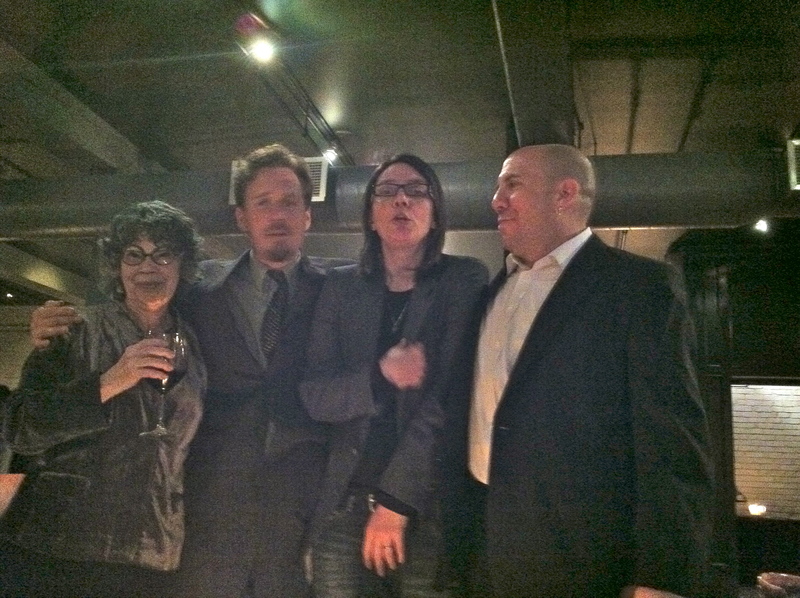 Last week, for example, I found myself in Toronto with three other first-time novelists. We met with a small crowd of industry people, all of whom dedicate themselves in one way or another to the production, reception, and longevity of the book industry. We ate, we drank, we were nervous: only one of us was going away with “the” prize. Of course, we were also all sharing an enormous honour, the honour of actually making a short list. As it turns out, the winner didn’t show up. We were left, the four of us, to ample alcohol and general good humour. ”We’re losers,” one of my fellow nominees said, “lets get a group photo,” and so we did. How to lose well. That’s the part of the process that can make or break a writer–understanding that the work is the point. A nomination more than enough. Winning is exceptional, and largely about luck: the one that a given jury can agree on. Getting on a list is a giant checkmark. You can move on. Feeling, in some small way, as though you have been given a nod. But it’s not that easy. Too many excellent books sneak by completely unappreciated. They make no lists whatever. I could ramble a list of excellent books that have not received any nominations… How, one wonders, does this happen? And worse, what are we doing talking about it? The whole process of prizes is something that most writers won’t even dirty their Twitter feed with. To speak of prizes, or worth, is seen as bad taste, and yet, they are in our faces at every turn. In every bio, including my own. So how do we deal with these highs and lows? Well, we need to minimize them for one thing. Think of the long view. Personally, I believe in writers. I believe in the writing practice. Yes, there are books that excite me, and I think it’s great to honour people who do well. But more than that, I believe in the long view. In a community of writers. In thinkership. In dialog. But above all, a personal practice. Books are great outcomes for that practice, but they are really the bonus of work done well. So, how do you become a successful writer? I’m not sure prizes help the daily work. Not as much as habit. Don’t break the chain, Jerry Seinfeld says. If something is important to you, do it every day. Mark an X on the calendar, and don’t break it. Do something once, or do something every day, Andy Warhol apparently said. Anything else is a waste of time. And the relationship needs to be protected from the notion of outcomes. Particularly the prize world. A writer’s relationship to the page. Self and page. That’s about the only thing that a writer has control over. They certainly don’t have control over jury selection. Or which reviewer will draw their book, and whether or not they like it. Being read well is an amazing experience. Totally addictive. Who doesn’t want others to think well of their work? To get excited about? Watch Twitter feed and you will see the anxiety of poets and reception at ever turn. Read the diaries of Virginia Woolf and again, the anxiety of reception with every novel. But you will also see a steadfast loyalty to her vision: even when she does realize what she has done that “sells well,” she doesn’t repeat it. Nominations, prizes–these things take us out of our daily practice. They are not really about you or your work, they are about prize systems and publicists. It’s important to the literary world, and I’m happy we have them. It’s also important to careers yes, but not as important as maintaining a clear-headed vision of what you’re doing in your work and why. Or, to quote Lynn Crosbie, or to quote her new book title, or, apparently to quote Mike Tyson, “Life isn’t about what you acquire. Life is about losing everything.” Lose it well. Make it worthwhile. Posted in Awards, Group Blog on Monday, April 30th, 2012 by Sina Queyras. Originally posted on The Poetry Foundation. Posted in comment and tagged prizeculture. Bookmark the permalink.